Coming Soon. Order the new Andre DVD now to secure your copy at this special price. 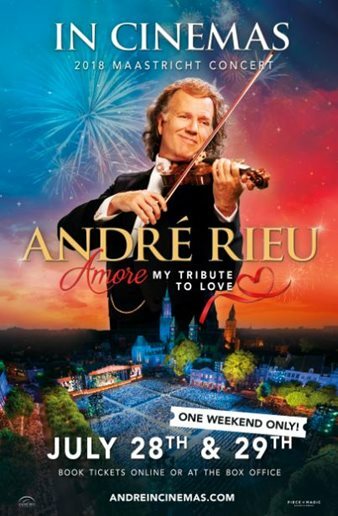 The Andre Rieu Live In Maastricht 2018 DVD was filmed live in July 2018 and is also known as his Amore My Tribute To Love DVD performance. André’s 2018 Maastricht concert is titled Amore My Tribute to Love and is André’s most romantic and spectacular concert ever. Affectionately known as 'The King of Waltz', André Rieu stages an annual summer concert series in his beautiful Netherlands hometown of Maastricht. Performing for thousands of fans from all over the world against the stunning medieval backdrop of the town square, the Maestro is joined by his famous 60-piece Johann Strauss Orchestra, sopranos, tenors and very special guests. The Maastricht concerts are André's most popular live concerts of the year. Click the button below to add the Andre Rieu - Live In Maastricht 2018 to your wish list.